Wheeljack is the mad scientist of the Autobots. Always inventing new weapons and gadgets. Most adept at driving while in care Mode. Likes to show off his stunts. Flying range of 800 miles using solid-fuel rockets in arms. Shoots magnetic inducer, shrapnel-needle, and gyro-inhibitor shells from his shoulder cannons. He is his own worst enemy. Often injured while experimenting with new weapons. Wheeljack is a brilliant risk taker, both in his lab and on the road. His inventions are both the cause of and solution to many problems as he pushes the boundaries of science and engineering in his quest for the next big thing. Due to the daring nature of his experiments, his lab needs to remain isolated – mostly because it blows up on a regular basis. Wheeljack. The Autobots’ mad scientist. Mostly known for his inventions blowing up (G1 episode: Heavy Metal War) or being stolen by the Decepticons and then blown up. On occasion, Wheeljack’s inventions do actually work (Fire On The Mountain) but most of the time they cause more hassle than good (The House That Wheeljack Built - Earthbase defence demonstration where the only way to turn off the system was from inside Earthbase. Something Wheeljack forgot when he demonstrated his creation to the other Earthforce members who were all outside the base at the time). However, in the G1 cartoon one of Wheeljack’s most notable moments was his participation in designing and building the Dinobots (the G1 comic portrayed the Dinobots origin differently) although at first they were considered too dangerous until Wheeljack messed around with the Dinobots’ brains a little more. My memory of Wheeljack is mostly from the G1 cartoon as I didn’t start reading the UK Marvel G1 comic until around issue 34 (Plight of the Bumblebee/Dinobot Hunt/Target 2006 era) and I don’t recall seeing Wheeljack making many appearances that stuck in my mind until much later in the comics run. In the comics Wheeljack had a run in with Josie Beller (Circuit Breaker) and was deactivated by her when Wheeljack tried to thank her for inadvertently saving him. Wheeljack was also instrumental in helping to bring Grapple, Smokescreen, Tracks, Hoist and Skids online and also later in creating the Aerialbots (Aerialbots over America) and possibly also the Protectobots. Wheeljack was then a casualty of Galvatron’s arrival on earth while the Autobots were under the command of Jetfire (Target 2006). After this, Wheeljack was under the command of Grimlock. Wheeljack eventually grew tired of Grimlock’s command and started to disobey his orders by helping three humans to escape death by contacting his old friend Sky Lynx. Wheeljack was then assumed to be destroyed in the Underbase saga as he was not seen until much later towards the end of the comics run when revived to help fight Unicron. In the G1 cartoon Wheeljack was last seen destroyed lying next to the remains of Windcharger in the 1980s movie. Apparently, Wheeljack was originally not supposed to have been destroyed as an early script depicted Smokescreen to be destroyed in place of Wheeljack. 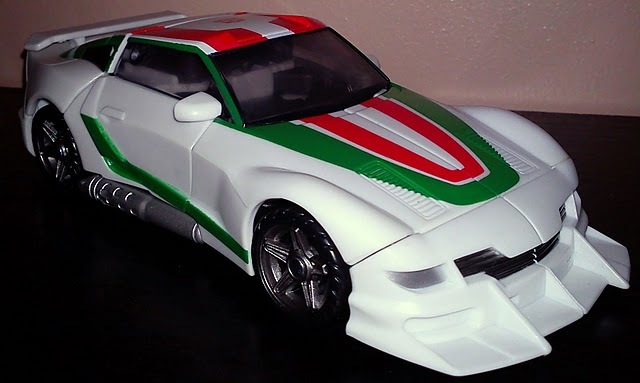 Wheeljack’s original G1 alt mode was a 1971 Lancier Stratos rally car. Later versions of Wheeljack have been a non transforming Action Master, Spychanger, an Autobot turned Decepticon (Armada) and a Ford Mustang GT in the Alternators/Binaltech series. Generations Wheeljack shares his alt mode with fellow Autobot Tracks (Reveal The Shield Turbo Tracks) but he has been slightly retooled to include a rear spoiler and an oversized front splitter making his vehicle mode more of a tuned racer type. 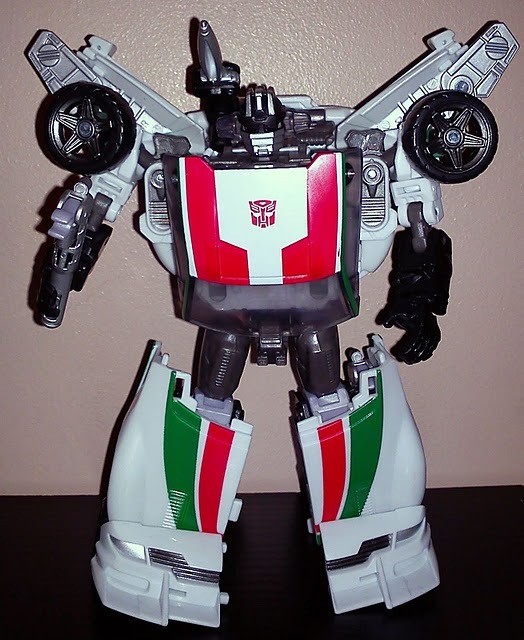 Wheeljack’s colours are mostly white with red and green detailing. There is also some dark grey and silver detailing on the front, rear and on the wheel rims. Wheeljack’s alt mode hides the majority of the robot parts quite well apart from when you look through the vehicle mode’s windows or underneath the car. 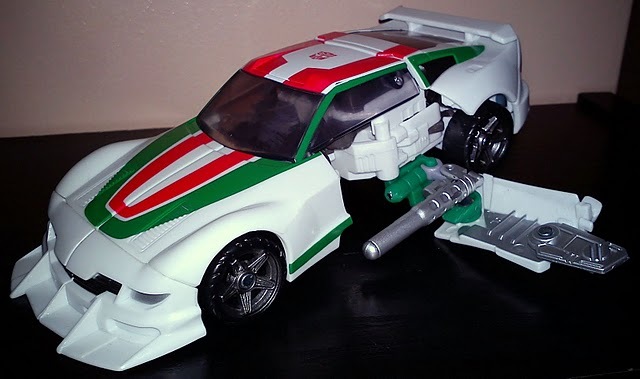 Wheeljack’s tools/clubs attach to the sides of the alt mode below the door sections to create an exhaust pipe of sorts (he has two exhausts molded into the rear section of the alt mode as well). Everything joins up quite well with very little in the way of panel gaps. Other detailing includes bonnet vents, door handles and fuel cap. The rear spoiler has been molded to the plastic section that would usually rotate to clip his mold-mates Tracks’ missiles on but even though this section has been cut out, the hinge joint is still present, although it can’t turn because of the spoiler. The whole look of the vehicle is really nice with a low stance and an aggressive sporty look. Wheeljack also has a flight mode. Although this is best forgotten as it looks awful. It doesn’t take very long to change Wheeljack into his flight mode if you must do it. This involves unclipping the exhausts, lifting the rear section up and removing the weapon from its storage compartment. Pull the door sections down (which will also put the main robot body on permanent show) and rotate them 90 degrees, then pull the doors outwards and they’ll slide into position. Close the rear section down and then rotate the small silver wings 180 degrees. Next clip the exhaust/tools back into their storage peg on the sides of the alt mode (except this time they’re now above the door/wings) and attach the figure’s main weapon underneath the alt mode. Colours are exactly the same as Wheeljack’s vehicle mode except for added bits of silver and green. Transforming Wheeljack involves only a few steps and everything locks in place very well. There’s even storage for his tools/clubs located on C clamps on the rear of each leg just by the knee. Wheeljack’s other weapon is a gun/missile launcher (non firing). This can either be held in his hand or, as I guess most people who own Wheeljack will prefer, the weapon can also be placed on either side of Wheeljack’s shoulders via a C clamp peg on the backpack/rear car section. All the colours mentioned in the Alt mode are on display along with more black, silver and dark grey sections. Wheeljack’s head is very much like his G1 cartoon and toy design apart from the fact that this Generations version actually has eyes and his side wing/speech lights are made of clear plastic. This gives a nice glow effect when there is enough light behind the figure (the alternator/binaltech version had similar but smaller and tinted clear plastic on the head). There are 10 pairs and one single point of articulation. These are the feet, heels, knees, upper legs, waist, wrists, lower elbow, upper elbow, upper arm, shoulders and the head. All this articulation should allow for quite a few poses. The only downside I can see is that due to the figure’s leg design (similar to the original G1 version) it looks like Wheeljack is a little short as his upper legs look quite small. This is because of the amount of the front section of the Alt mode that makes up the lower legs and feet. But hey, at least he hasn’t got the monkey arms of the original ‘80s toy (he could almost scrape his knuckles on the floor). Overall I think that Wheeljack is another great addition to a Transformers collection and one that I’m glad to have bought. Also, being a Wheeljack fan helps! Transformation Design: 7 – Not very hard to transform and everything unfolds nicely. Virtually no robot parts on show in alt mode, but not-so with the poor flight mode. Durability: 6 – Feels very well built but Wheeljack’s shoulder wings are quite thin which I could see breaking if not careful. 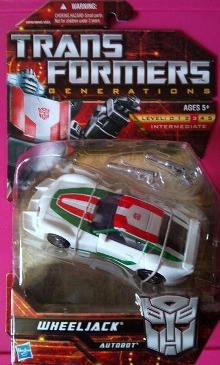 Fun: 8 – It’s Wheeljack; a sports car and a mad scientist. Remember the scene from Toy Story where the kid next door blows things up (usually other toys)? Or Egon Spengler from The ‘80s Real Ghostbusters? That could be Wheeljack! Lol! Aesthetics: 7 – Mostly white but with well thought through decal colours which work well. Articulation: 8 – Loads of movement which should make for some varied poses. Value/Price: 6 – If you can find him at retail or slightly more then a great purchase. However as Wheeljack was released near the end of the Generations line and was shortpacked, he can command quite a high price on some online stores (mine was �25 inc delivery at one per customer only) . Overall: 7 – A nice figure and a great update to a character that should have received much more love over the years.